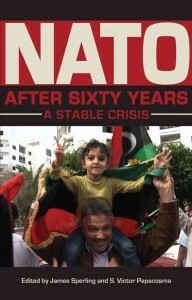 NATO after Sixty Years addresses the challenges of adaptation confronting the North Atlantic Treaty Organization in the early twenty-first century. Comprised of essays from a range of experts, each chapter examines an aspect of NATO’s difficult adjustment to the post–Cold War security challenges within and without its treaty-based responsibilities and competencies. In the book’s introductory chapter, James Sperling establishes the framework and analytical themes to be developed and explored. The first set of essays discusses the changing operational and strategic purposes of the alliance. Sean Kay examines the problem of sustaining the deterrent capability and collective defense function of the alliance, particularly the debate over ballistic missile defense. Mark Webber considers the expanded role of NATO peacekeeping operations in the Balkans and its implications for NATO as a military alliance, while Stanley Kober discusses the negative impact of Afghanistan on alliance solidarity and credibility. The second section examines the expanded geographical reach and responsibility of the alliance. Melvin Goodman traces the engagement of the alliance with the Russian Federation, and Yannis A. Stivachtis explores NATO’s role in the southern and eastern Mediterranean. Stephen J. Blank covers allied interests in the Black Sea region and the potential liabilities and benefits of an active NATO engagement in that region. Nathan Lucas delivers a skeptical analysis of NATO’s ability and need to claim the Persian Gulf and Indian Ocean as strategic areas of operational responsibility. The final chapters position NATO in the institutional context that will shape its evolution as a security actor in the new geostrategic environment. Lawrence Kaplan establishes the potential role of NATO as an agent for the United Nations. Dennis Sandole focuses on the complementary relationship between the Organization for Security and Cooperation in Europe and NATO. Stanley Sloan investigates NATO’s fraught institutional relationship with the European Union, particularly the emergence of the latter as an increasingly effective security actor. Finally, Jamie Shea reflects on the difficulty of crafting a new strategic concept that would ensure NATO’s continuing viability and credibility as the primary security institution for the nations of the North Atlantic area. This volume offers the basis for guarded optimism that NATO will persist and continue to perform its twin functions of collective defense and deterrence into the foreseeable future, despite the periodic crises that temporarily cast its future into doubt. An in-depth exploration of research and emerging ideas, NATO after Sixty Years is essential reading for those interested in NATO’s past and present as well as looking to its future. James Sperling is professor of political science at the University of Akron. S. Victor Papacosma is professor emeritus of history and director emeritus of the Lemnitzer Center for NATO and European Union Studies at Kent State University.